Lots of travel, running, beer-drinking, and rock. I’ve been fairly busy. Steve and I moved cities back in March and we’ve also been on several small trips, so it feels as though I’ve been “in transit” quite a lot this year. In April we took a pretty big trip to Orlando, FL, to participate in the Star Wars Dark Side Challenge at Disney World. This was a 10K on Saturday followed by a half marathon on Sunday. We also did the 5K on Friday because…you know, that wasn’t enough running for us, apparently :). It was an, uh, interesting experience; one I’m not in a big hurry to have again, frankly! But I’m glad we went. We did have fun. …and on our way out of the city, we made a detour to Oak Alley Plantation, where we took a guided tour of the house and self-guided tour of an exhibit about slavery. Part of the movie Interview with the Vampire was filmed here. The house and grounds were quite gorgeous! Steve and I are also doing this Texas 6-pack 5K beer challenge thing this year, where you participate in a bunch of races at different independent craft breweries around the state. Each race benefits a different local charity. We’ve completed five so far, in San Marcos, Goliad, San Antonio, Seven Points, and Katy. These events have all been super fun, even if coming back from Seven Points (about an hour outside Dallas), we got stuck in major traffic for hours :(! Boo!! Although I was excited to finally try the “Brew of H,” too — being a UH alum and all :). Earlier this month we saw At the Drive-In, Metallica, and Iron Maiden in concert (not all at the same time, though, ha). They were all awesome performances and I’m really grateful I got to see them. Metallica and Maiden both have super impressive visual effects and stage shows! If you get the chance to check them out, I highly recommend it! If you are in a relationship, do you feel pressured to make special occasions “perfect” for your significant other? I was reading something recently about the anxiety some men feel on Valentine’s Day. They know their wife or girlfriend has really high expectations and are worried they won’t get the day “just right” for her. I asked my husband if he felt that way. He said he felt some pressure the first Valentine’s Day we spent together, because we’d only been dating since November and he wasn’t sure what I expected. I remember that first Valentine’s Day, of course. He offered to make dinner for me at my new apartment. 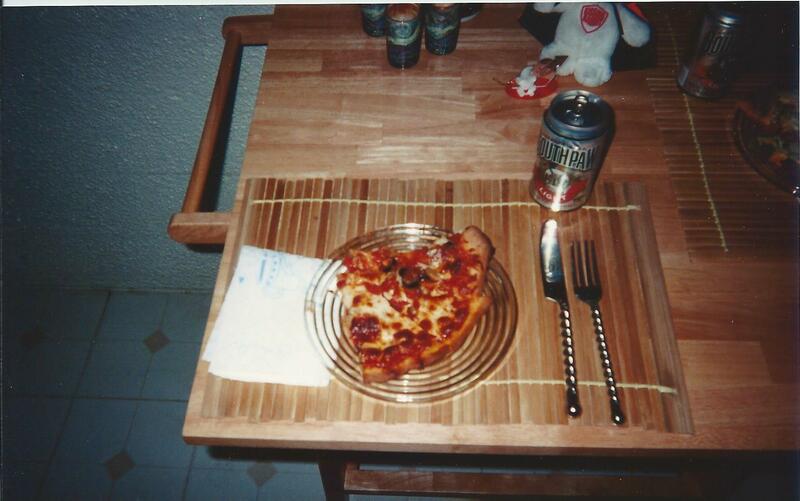 I said that would be nice and suggested he make a pizza and bring over some beer. Yeah, I’ve always had pretty refined tastes ;). 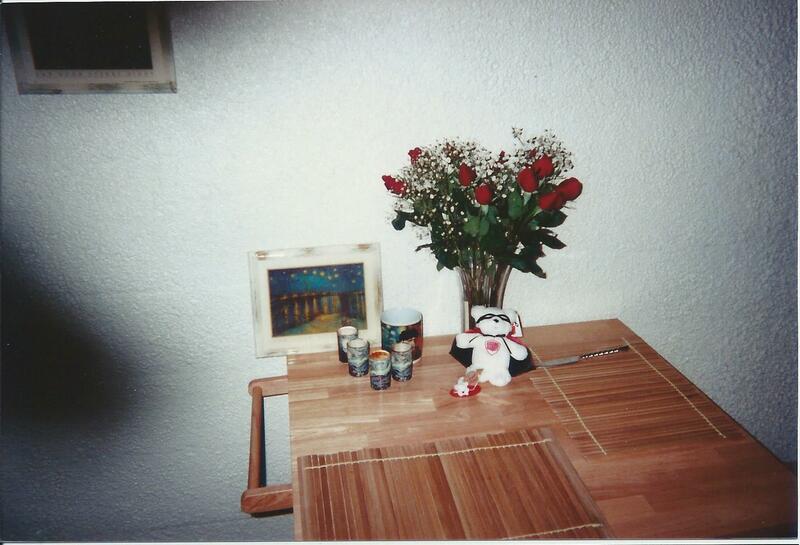 I found some pictures from that first V-Day S and I spent together, back in 2000. They aren’t the greatest because they are scanned from prints I’m pretty sure were taken with a disposable camera! 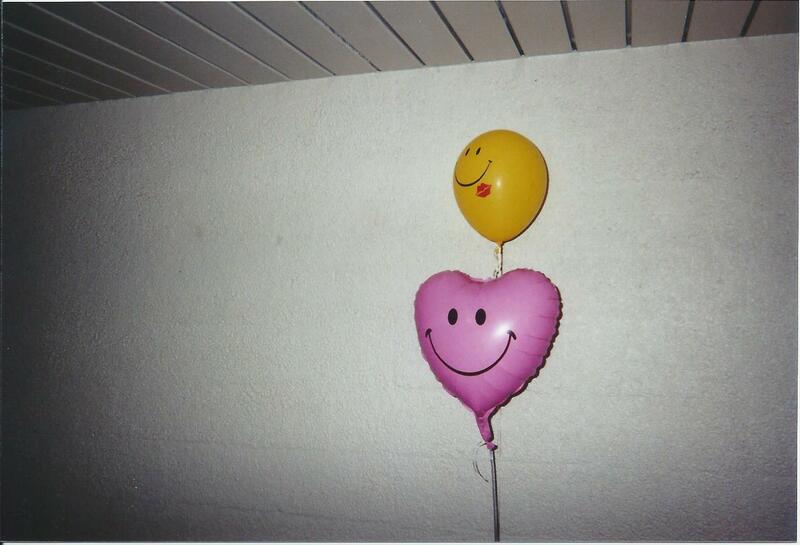 But it’s fun to look back and remember the cute balloons, bear, and roses he brought me. And of course the meal he prepared! 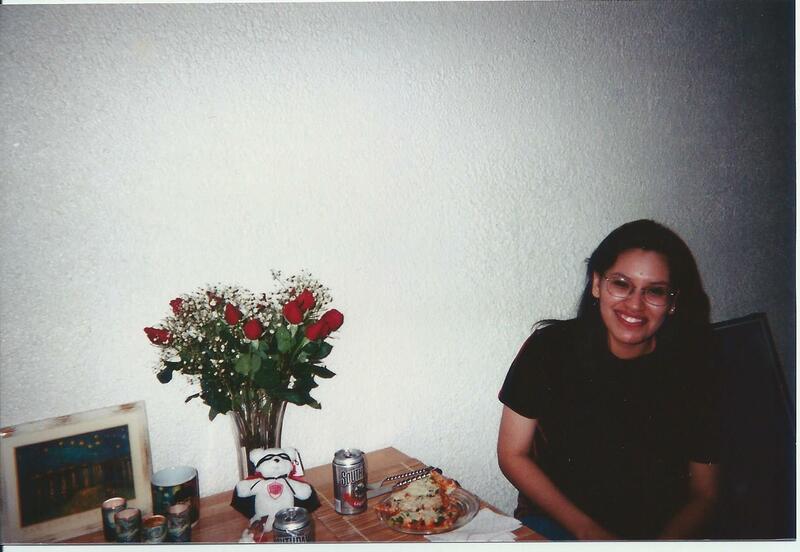 And here I am, looking rather young and quite pleased with my slices of pizza and can of beer. I can’t fool myself into thinking I still look that young (alas!) but I like to think I still look that happy :). I find it interesting that in the beginning of a relationship, every little thing a man does for you can seem like such a big deal, but then, over time, you can start to take things for granted. It’s just human nature. But that doesn’t mean it’s inevitable. It’s always good to remember how lucky we are to have special people in our lives, whether they be spouses, SO’s, friends, or relatives, and it’s also good to remember that we don’t need to give each other fancy presents to prove we care about one another. As for my husband, he assured me that nowadays when it comes to holidays, he “doesn’t sweat it.” Ha, ha! He said it helps that I’m easy to please, and that we haven’t exchanged gifts on Valentine’s Day for years now, anyway. We just exchange cards and look for a way to spend time and have fun together (and he does still get me flowers). We usually do not even go out on the actual holiday, as every place is packed and neither of us loves crowds. This year we plan on picking up some takeout (Pad Thai, perhaps?) and eating it here at home. I’m also making these skinny red velvet cinnamon rolls tonight, so we can have them for breakfast tomorrow. I’m excited about them and really hope they turn out!! I hope you have a pressure-free Valentine’s Day tomorrow. Whoever you decide to spend it with, I hope you will thoroughly enjoy that person’s company and take the opportunity to try and let them know they are loved; that is the quickest route to happiness, anyway, is by making someone else smile!